All the live detailed updates from the game between India and Malaysia. India has a good chance of winning this one. India take on Malaysia in their fourth match of the ongoing hockey World Cup. They lost the first two games against Belgium and England but managed to hold on for a draw against Spain. India will, however, fancy, their chances against Malaysia. In 105 meetings, India have only lost 14 times to Malaysia. In World Cups, India have defeated Malaysia thrice in four outings, with their only defeat coming at the 2002 World Cup. This is one match, they must win. The match begins at 6:00 pm IST. Join us for the live coverage then. For India, despite the losses, Sreejesh (the goalkeeper) has been a star. He has often, in this tournament, been the difference between a close defeat and a rout. 56 mins: Beautiful skills by Lalit. Superb stickwork, draws ooh and ahhs from the crowd. Doesn't get a goal but wins admiration. From right to left, beats three defenders in the D.
Akashdeep scores his first goal of the afternoon to send India back into the lead. The icing on the cake. India's third goal. 60 mins: Into the final 10 mins. Very open game, India still in charge. 61 mins: GOAL! Malaysia get one back again to close the gap. Ind 3-2 Mal. Marhan smashed it in from the edge of the circle. This game is pretty much going down to the wire. India's defenders need to be careful. 63 mins: Good save from Sreejesh. It was a four on three break by Malaysia. Before we can breathe, India have reached the other end. 65 mins: Into the last 5 mins, surely India won't concede again. They can't. They simply can't. 66 mins: India miss a clear one on one with the Kumar (the Malaysian goalie). Superb play by Rupinder before that. 68 mins: Just two mins remain. Can India hold on? India need to just keep possession -- they are doing that for the moment. 69 mins: Malaysia on the break but their striker's first touch lets him down. India survive. Just. 70 mins: That is the long hooter. India have their first win of the 2014 hockey world cup. 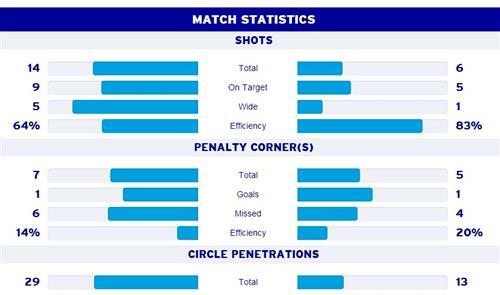 Full match statistics. India's numbers on the left.